Lindsey Buckingham performed his Fleetwood Mac “Rumours” classic, “Never Going Back Again”, at the Hardly Strictly Bluegrass Festival in San Francisco, CA on October 5. The 3CD career-spanning set includes a pair of previously unreleased tracks, “Hunger” and “Ride This Road”, as well as live versions of solo and Fleetwood Mac hits; the package is also offered as an abridged single disc set and digitally, with a 6LP vinyl edition to follow on November 30. 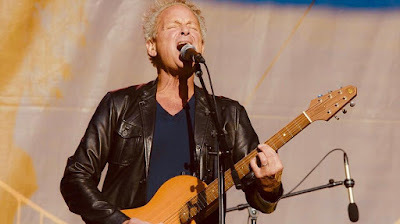 Following his split from Fleetwood Mac earlier this year, Buckingham kicked off an extensive North American tour in Portland, OR on October 7.